And my husband is not a foodie so he didn't go too long for any food. When I was very sad of not getting 'Nolen Gur', suddenly get a phone call from my dad, and he informed me, he had sent 'Nolen Gur' by courier service. Take a large pan, heat the milk. When the milk will start boiling, simmer the heat and start adding lemon juice slowly all over the pan. When the milk will start curdling, turn of the gas and add rest of the lemon juice. Cover the pan and let it be for 5 more minutes. After 5 minutes take a large strainer, put a cheese cloth on it and strain the chhana. Now wash the chhana under tap water to remove the lemony smell & the tangy taste for few seconds. Now take the four corners of the cloth and make a knot and hang from the tap to remove excess water for 1 hour. Remember the chhana may not be too dry or too moist. In the meantime prepare the jaggery syrup. 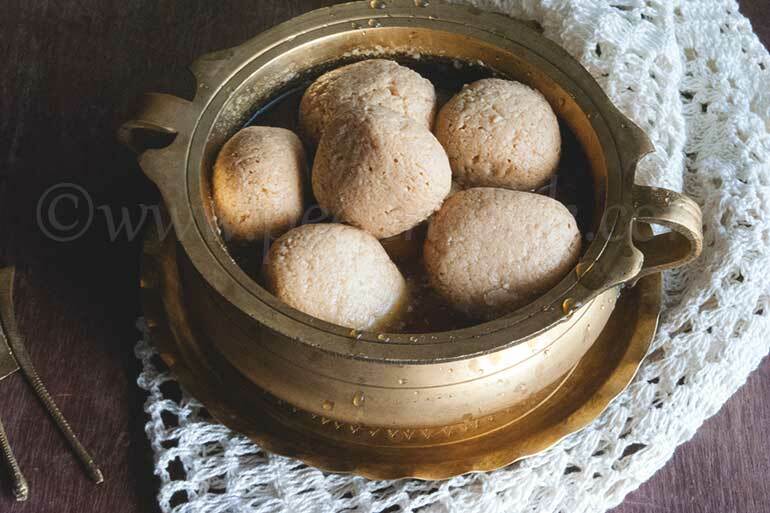 Take a wide mouth and deep bottomed pan, add jaggery, sugar & water in it. Put the pan on high heat and bring the syrup to a nice boil. When the syrup will start boiling, turn off the heat. After an hour take a large plate and put the channa on the plate. Now start kneading with your palm till the chhana becomes smooth. It'll take at least 10 minutes. Now make 12 equal sized balls out of the kneaded chhana. 12 rosogollas out of 1 liter milk will be standard size. If you want larger, may prepare 8 balls. Heat the sugar syrup again and let it start boiling. When the syrup will start boiling add the chhana balls 1 by 1. Cove the pan and let them boil for 30 to 35 minutes on medium heat undisturbed. After 35 minutes, turn off the heat and leave them for an hour. After 1 hour serve the 'Nolen Gurer Rosogollas' or you may keep them refrigarated for enjoying chillied.